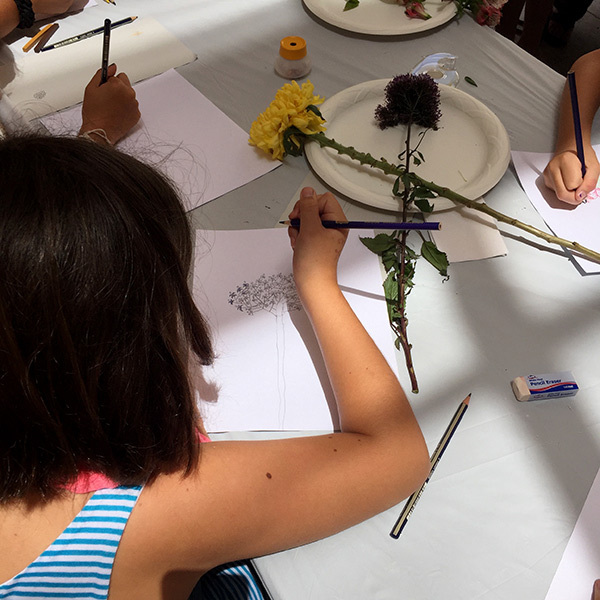 This summer we had a full schedule of family-focused activities at the Getty, including concerts, tours, and hands-on workshops. 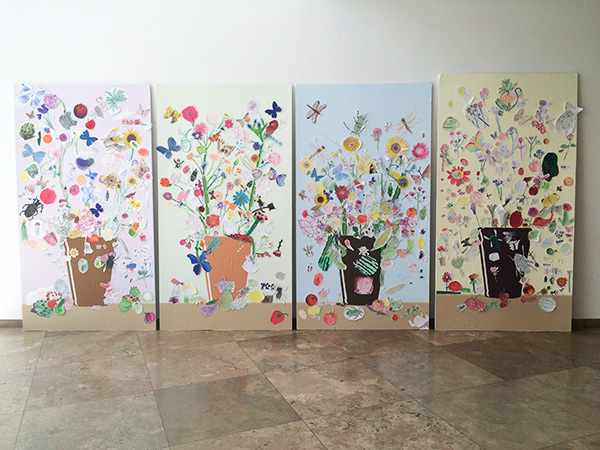 My favorite was Art Lab: Still Lifes in Blossom, a program that took place across four days. 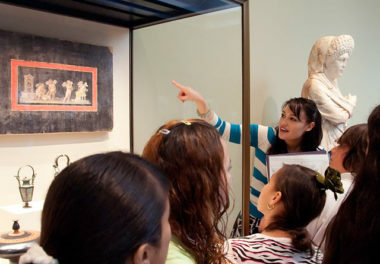 Art Lab combines an exploration of art in the galleries with a hands-on art-making experience. 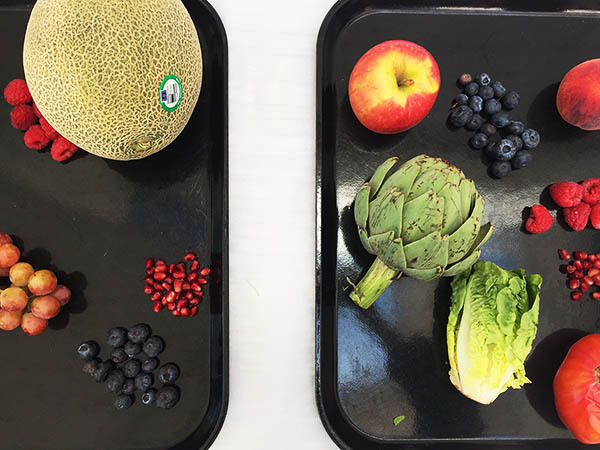 This summer, families entered into the mind of Dutch still-life master Jan van Huysum and created a giant collective still life based on two of his paintings in the Getty Museum’s permanent collection, Vase of Flowers and Fruit Piece. Both still lifes are layered with thin oil glazes to capture the brilliant colors and delicate textures of the blossoms, creating a highly finished surface. Participants examined the paintings in the Museum galleries, and everyone especially loved to spy out the tiny ants crawling on a tasty peach. 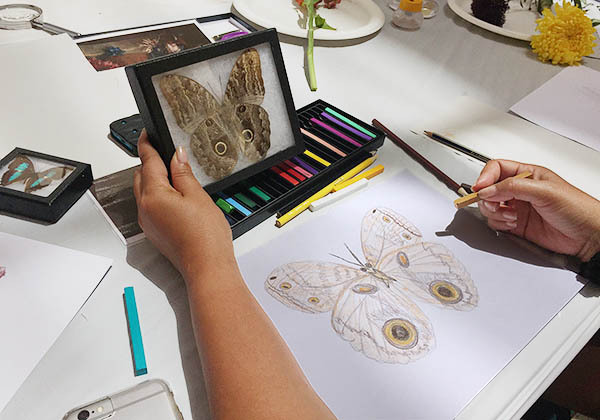 Participants selected an object to draw from life (or death, in the case of insect specimens), choosing among items such as fruits, vegetables, flies, and flowers. Using a magnifying glass and simple drawing materials such as colored pencils, they then got to work creating their own representation of the still life object of their choice. 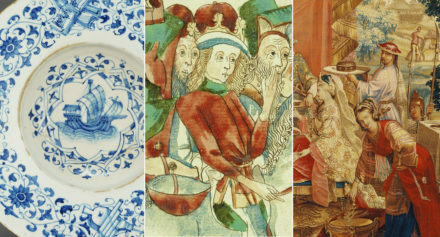 Once individual drawings were completed, participants added them to the communal still life. Bringing the visitors of the Getty together to create a masterpiece struck me as brilliant. Participants’ individuality came out in their artwork, and the end result was splendid and original. 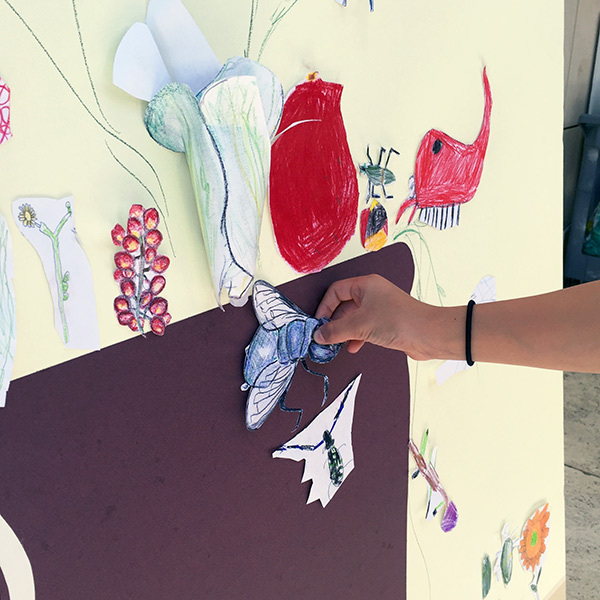 Children enjoyed getting to see what their parents created, and adults thought about how what they made would interact with the fruits and flowers that other participants had drawn and already affixed to the mural. 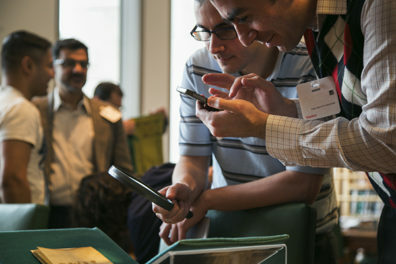 Many people returned to check on the piece’s progress throughout the day. Here’s the giant communal masterpiece! Each panel is 48 by 88 inches, and all four together make a mural that’s nearly 8 by 16 feet. Congratulations to all the participating artists!